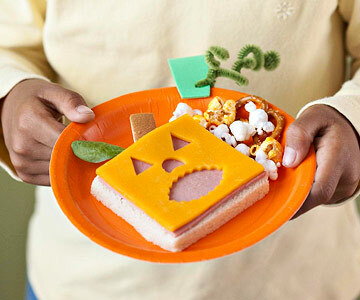 These cute jack-o-lantern sandwiches are a fun and super easy lunch for Halloween on Monday. You could even do them in miniature on crackers for an appetizer on Halloween night. 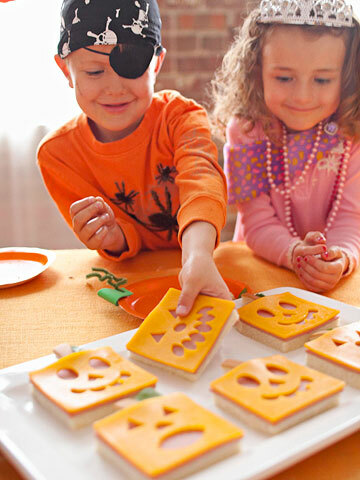 This cute jack-o-lantern sandwiches idea comes from BHG's Pumpkin Party. 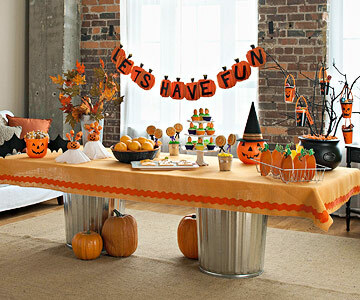 You can check out all of the images on the Party like a Pumpkin post, and make sure to check out the table they made from trash cans and a piece of plywood. We used to make jack o' lantern pizzas--English muffin for crust, pizza sauce, and slices of of mozzarella cut like a jack o'lantern. A fun, quick dinner before trick-or-treat!